Introduced in 2000, the 147 followed Alfa Romeo's usual formula for its Volkswagen Golf-rivalling hatchback, giving it seductive looks inside and out. 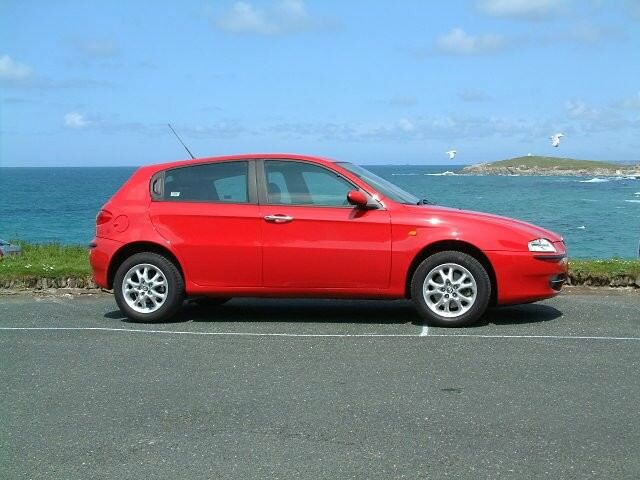 Replacing the 145/146 range, the Alfa Romeo 147 shared a good deal of its underpinnings with its larger 156 saloon relation. That meant entertaining handling, regardless of which engine you picked. The range of engines largely follows what you'd expect in a family hatchback, Alfa Romeo offering the 147 with 1.6- and 2.0-litre petrol engines, as well as a 1.9-litre turbodiesel badged JTD. It wouldn't be an Alfa though without some wilder incarnation, and that was supplied via a 3.2-litre V6 petrol engine with 250hp and shocking performance to match. Visually the GTA benefitted from wider front and rear wheelarches and a more aggressively sporting body kit outside and sports seats inside. All 147s are front-wheel drive and it was substantially facelifted in 2004. Those cars now feature a narrower front grille that apes the look of the Alfa 159. Five- and six-speed manual gearboxes were offered, as was Alfa's semi-auto Selespeed transmission, which is a robotised manual shift with two pedals. Both three- and five-door body styles were available. All require a little bit more attention than your average family hatchback: the twin-spark 2.0-litre petrol engines have a prodigious thirst for oil, and it's unwise to buy any model unless it comes with a full service history - and the cambelt has been changed on the four-cylinder cars every 36,000 miles (about 58,000 kilometres) or three years. Either the 1.6 petrol or the 1.9 JTD are best, depending on what sort of distances you plan on using it for - the diesel for long trips thanks to its greater economy it offers. The 1.6 is fine for most though, in either Lusso or Turismo specification. Post-2004 cars benefit from improved standard specification as well as the updated appearance. A good-looking alternative to the mainstream norm, the Alfa 147 might not be quite as spacious or as cheap to run as its more mundanely styled rivals, but if you're seduced by the looks you'll not care. Service history is important if you want to keep costs sensible, though there are enough around to be choosy.